Fatehpur: At least 35 passengers were killed and over 200 injured when 15 bogies of a speeding Delhi-bound Kalka Mail derailed here on Sunday — the second major train mishap in a week in Uttar Pradesh. The derailment took place at 12.20 pm when the packed train from Howrah reached near Malwa station, nearly 120 kms from Lucknow. Railway Board Chairman Vinay Mittal, who rushed to the accident site, said the cause for the derailment was being ascertained. According to preliminary investigations, the signals were functioning normally and the fish plates on the tracks were intact. The Commissioner of Railway Safety has been directed to probe the incident,” General Manager, North Central Railway HC Joshi said. The army has also sent about 120 personnel from adjoining Allahabad and Kanpur to assist them. A team of National Disaster Response Force was also deployed. Two relief trains — one each from Allahabad and Kanpur — were sent to ferry the passengers. Minister of State for Railways Mukul Roy said families of the dead would be given an ex-gratia of Rs five lakh, while the seriously injured would get Rs one lakh and those with minor injuries would be given Rs 25,000 each. 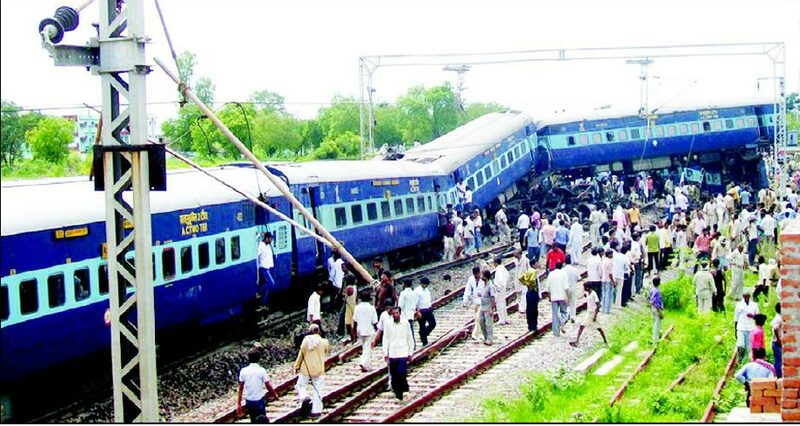 Prime Minister Dr Manmohan Singh and Congress President Sonia Gandhi expressed deep sorrow and shock at the loss of lives in the rail accident. Uttar Pradesh Chief Minister Mayawati announced a compensation of Rs one lakh each to the kin of those who died, Rs 50,000 to seriously injured and Rs 25,000 for those suffering minor injuries.